Bruno soon took to drinking milk from a bottle. It was but a step further and within a very few days he started eating and drinking everything else. And everything is the right word, for he ate porridge made from any ingredients, vegetables, fruit, nuts, meat (especially pork), curry and rice regardless of condiments and chilies, bread, eggs, chocolates, sweets, pudding, ice-cream, etc., etc., etc. As for drink: milk, tea, coffee, lime juice, aerated water, buttermilk, beer, alcoholic liquor and, in fact, anything liquid. It all went down with relish. Out came his medical books, and a feverish reference to index began: “What poison did you say, sir?” he asked “Barium carbonate” I said. “Ah yes—B—Ba—Barium Salts—Ah! Barium carbonate! Symptoms— paralysis—treatment—injections of ... Just a minute, sir. I’ll bring my syringe and the medicine.” Said the doc. I dashed back to the car. Bruno was still floundering about on his stumps, but clearly he was weakening rapidly; there was some vomiting, he was breathing heavily, with heaving flanks and gaping mouth. I was really scared and did not know what to do. I was feeling very guilty and was running in and out of the vet’s house doing everything the doc asked me. The months rolled on and Bruno had grown many times the size he was when he came. He had equaled the big dogs in height and had even outgrown them. But was just as sweet, just as mischievous, just as playful. And he was very fond of us all. Above all, he loved my wife, and she loved him too! And he could do a few tricks, too. At the command, ‘Bruno, wrestle’, or ‘Bruno, box,’ he vigorously tackled anyone who came forward for a rough and tumble. Give him a stick and say ‘Bruno, hold gun’, and he pointed the stick at you. Ask him, ‘Bruno, where’s baby?’ and he immediately produced and cradled affectionately a stump of wood which he had carefully concealed in his straw bed. But because of the neighborhoods and our renters’ children, poor Bruno, had to be kept chained most of the time. What specific details in the above story tell us that the author was a wealthy man? 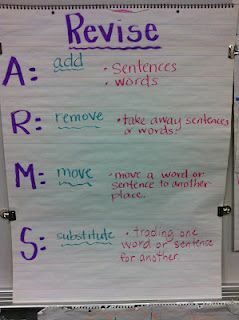 Use specific details from the story. Pins Related to W.7.5 more..
Revising vs. 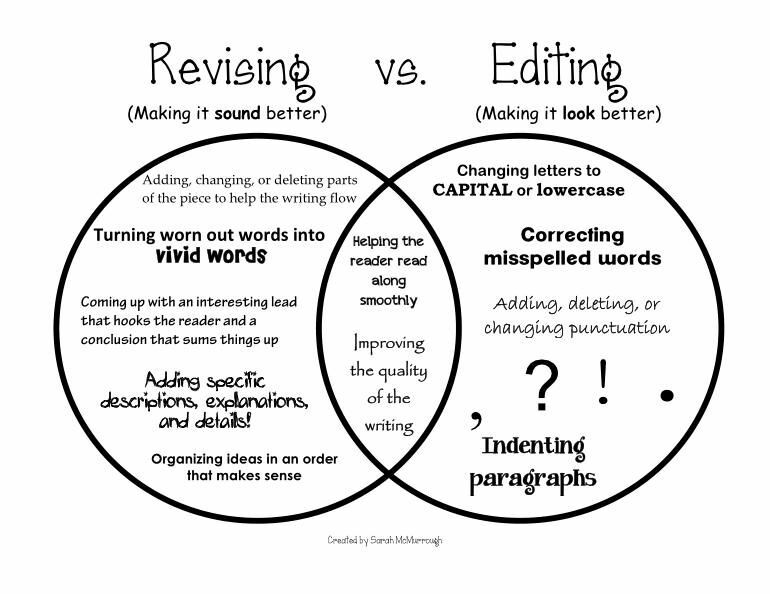 Editing - I like the idea of having a visual showing that revising and editing overlap. In order to assign Measure twice, cut once - the importance of planning Lesson to your students, Sign up for a FREE Account!